The Willis Fleming Historical Trust is custodian of the Willis Fleming family's heritage -- the legacy of the natural philosopher Thomas Willis (ob. 1675) and the judge Sir Thomas Fleming (ob. 1613). Our mission is to identify, conserve, and memorialise this heritage in creative and pioneering ways. Key to our work is historical and theoretical research, focusing on the boundaries of Thomas Willis's legacy -- from the seventeenth century to the present day. Our areas of research are wide-ranging and interdisciplinary. This research, together with fieldwork and study of our collections, informs our ongoing projects and programmes. We have an emphasis on working with individuals and organisations as collaborators, and undertaking projects that have strong elements of public engagement and education. The Trust is currently championing the heritage of North Stoneham Park in Hampshire -- working to restore the WW1 War Shrine and part of the former parkland, and revisiting lost North Stoneham House. The Muniment Room is investigating the ways in which people, places, and documents link together across the four centuries of the Fleming Estate's history. Another long-term project is the reconstruction of the Library of the antiquary Browne Willis. The Trust is independent and not-for-profit, and funded entirely by donations and grants. If you have an enquiry, or just wish to register your interest in our work, we would like to hear from you. 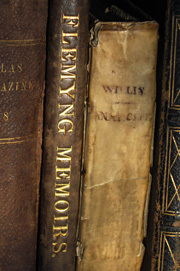 Copyright © 2005-2013 The Trustees of the Willis Fleming Historical Trust. All rights reserved. Sitemap.